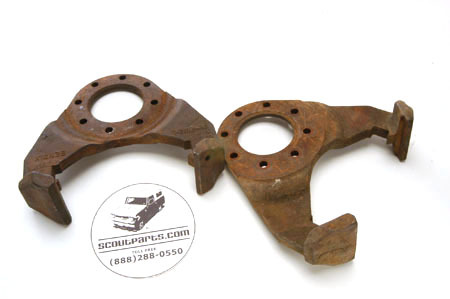 These are a pair of new old so caliper brackets as used on 1974 to 1980 Scout II. These are the correct 8-bolt caliper brackets. (All other manufacturers used 6-bolt caliper brackets.) These are about the hardest item to find when you are trying to do that disc brake conversion on your 1972 and 1973 Scout. To complete the conversion, you will also need the 8-bolt knuckles (available used and new), and a pair of 8-bolt dust shields (available new in polished stainless steel). Be aware that for a full conversion, you will also need to change the master cylinder, the booster, the proportioning valve, the rear drums, shoes, and backing plates.